As the owner of Ahdoot Oriental Rugs, I’m often asked to perform expert rug appraisals for a variety of reasons, and I always appreciate when my clients are as interested in a rug’s history and artistry as they are in their rug’s value. As you likely already know, two of the most influential factors that go into determining an Oriental, Persian or Turkish rug’s value are its antiquity and where it was manufactured. However, a rug’s quality of workmanship, size and the materials utilized in its creation also play a significant role. Whether you’ve received your Oriental rug as part of an inheritance, purchased it from a dealer or a private individual, or obtained it through countless other ways, knowing what your rug is worth means more than just knowing its value in terms of a dollar figure. While the actual cost of replacement or value on the market is important, it’s equally important to know what an exquisite masterpiece has come under your ownership. Today, we will explore 3 of the best reasons to have your rug appraised. Most often, rug appraisals are done as a requirement by insurance companies in order to protect an investment adequately. At Ahdoot, we take special care in offering you the full replacement value of your rug in the event it becomes irreparably damaged through fire, flood or any other means, which ensures you receive the full compensation from your insurance company. In my 40 years in the Oriental rug business, I have heard numerous stories about clients losing these precious works of art before having them insured. My suggestion to clients, and anyone who owns an expensive contemporary or antique rug, is to get your rug appraised and insured immediately. If you are considering the sale of your Oriental, Persian or Turkish rug, then you will certainly need to know its value in the current marketplace. Online estimates only give you part of the story, while a thorough in-person inspection, in your home or at our showroom, can potentially push the value of your rug upwards by hundreds or thousands of dollars. Though less common, I have many times over the years performed an appraisal for clients who want to offer their rug to a museum, charity or other non-profit entity for exhibition. Currently, the IRS calls for any donation exceeding $5,000 to have an appraisal done by an accredited appraiser. If you are interested in making a charitable contribution of your antique rug to an organization and want to include this donation on your taxes, getting a written appraisal from Ahdoot is part of that process. Beyond appraisals, Ahdoot also recommends giving your rug a thorough cleaning at least once a year to preserve its value and energize your rug’s natural dyes and materials. At the same time you’ll also be eliminating a host of allergens and other environmental contaminants that are harmful to children, pets and allergy sufferers. 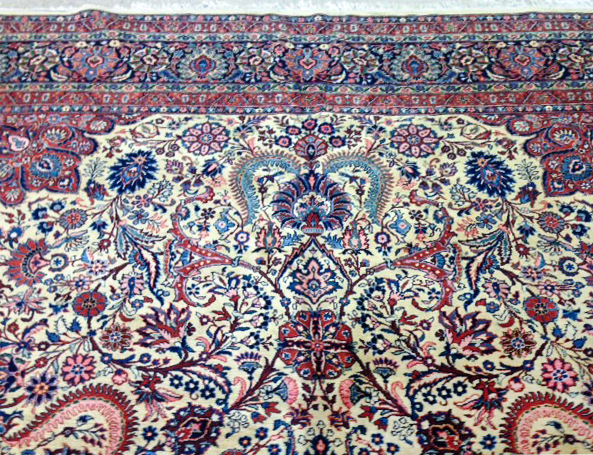 In addition to cleaning, we also recommend using our specialized Oriental rug repair service to maintain the quality of your rug and keep it from losing any value due to wear, fraying or other types of damage. Our rug repair experts are trained in every aspect of restoration and can skillfully restore your rug with unparalleled precision, so you can again enjoy the luster of your handmade investment.